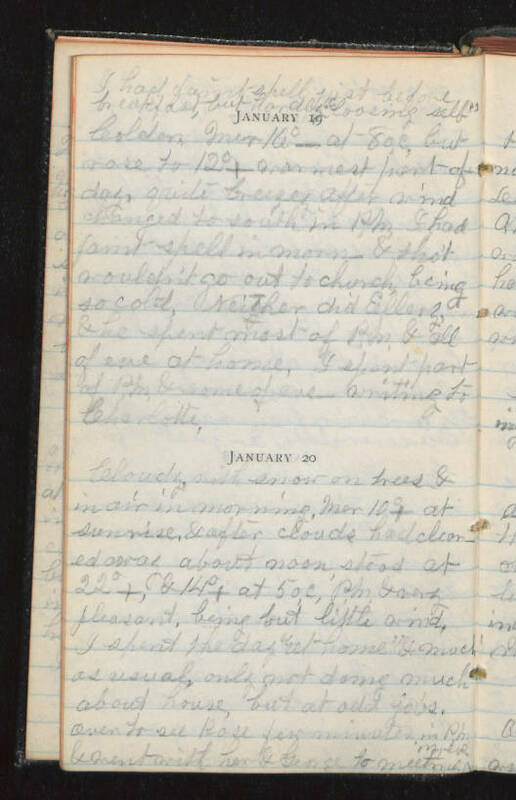 January 19 I had fainting spell just before breakfast, but [hard] "loosing self" [illegible] Mer 16°- at 8 o,c, but rose to 12°+ warmest part of day, quite breezy after wind changed to south in PM. I has faint spell in morn- & tho't wouldn't go out to church being so cold, neither did Ellery & he spent most of PM & all of eve at home. I spent part of PM & some of eve writing to Charlotte. January 20 Cloudy with snow on trees & in air in morning, mer 10°+ at sunrise & after clouds had cleared away about noon, [read] at 22°+, 14°+ at 5 o,c, pm & very pleasant, being but little wind. I spent the day "at home" much as usual, only not doing much about house, but at odd jobs. Over to see Rose for minutes in PM * went with her & George to meeting in eve.